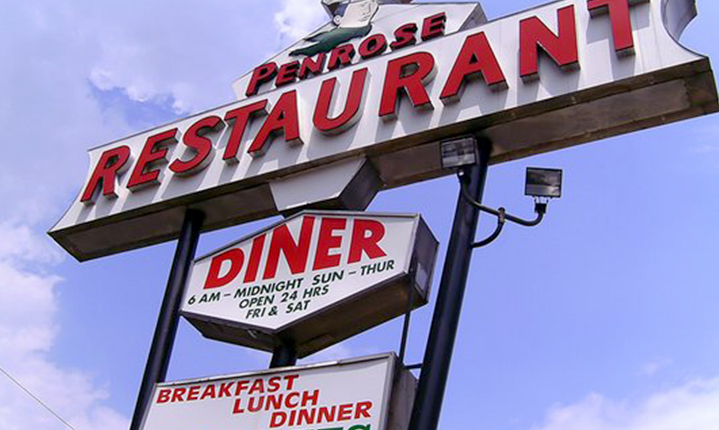 If you are looking for fantastic food the next time you’re in Philadelphia, then why not eat at the award-winning Penrose Diner? Having been voted the Best Diner in South Philly for seven consecutive years, the food here is outstanding. Family-owned and operated, here they pride themselves on having “fast, friendly service, fresh ingredients, made-to-order dishes – all-encompassed in a clean, family-friendly atmosphere.” Open for breakfast, lunch, dinner, and late night meals, their large menu has something for everyone. Breakfast (6AM-11AM) favorites include their Ham Steak & Two Eggs, Chipped Beef, and Eggs Benedict. You can also order a custom-made breakfast sandwich with a fried egg and any of the following: ham, bacon, sausage, Italian sausage, pork roll, scrapple, Canadian bacon, turkey ham, or turkey sausage. When lunch (11AM-3PM) rolls around, we recommend starting with their Broccoli Bites or Buffalo Wings. Then try their Balsamic Chicken, Spinach Salmon, Country Style Ham Steak, or Stuffed Manicotti Parmesan. They also have plenty of burger and steak sandwich options to choose from. The dinner menu features items like Pork Chops, New York Strip Steak, London Broil, Broiled Scallops, and Fried Flounder. Another guest favorite is their Stuffed Salmon Filet that is filled with signature crab meat stuffing and served with lemon and butter sauce. From midnight to 6AM patrons can enjoy specialty sandwiches like their Open-Faced Reuben, Monte Cristo, Philly Tuna Melt, French Dip, Chicken Foccacia, Gyro, and Patty Melt. They also serve up wraps, paninis, entree salads, and more. Be sure to try their French Onion soup as it consistently receives rave reviews. The Penrose Diner is located at 2016 Penrose Avenue in Philadelphia, PA. For more information, click here to visit their website – or call directly at (215) 456-1097.